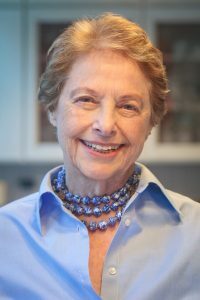 Editor's Note: Mimi Sheraton is one of the most influential food writers in the United States. From 1976 to 1983 she was the restaurant critic for the New York Times, and was the first woman to occupy that position. After leaving the Times, she worked for a variety of magazines, including Time, Condé Nast Traveler, Harper’s Bazaar, Vanity Fair and Vogue. She has written numerous books, including cookbooks, restaurants guides, culinary histories and a memoir, and has won awards from the International Association of Culinary Professionals and the James Beard Foundation. Her latest book, 1,000 Foods to Eat Before You Die: A Food Lover’s Life List, was published by Workman Publishing in 2014. Sheraton recently sat down with Ari Ariel to talk about her career and how her work converges with the fields of history and food studies. AA: Although most of your writing has been for a popular audience, you seem to have tendency toward an academic or social science method. MS: I think that’s probably true. When I left the Times, my editor there told me that the most letters of protest they received about my leaving were from academics. And he was my editor only for restaurant reviews, because they were in a separate section then. They weren’t in the food section at that time; they were in the weekend section. Also, Frank McCourt’s book, Teacher Man, has almost an entire chapter on my work, which he assigned to his English classes at Stuyvesant High School. Every week they had to read Mimi Sheraton’s review and then go to the cafeteria and do a “Mimi Sheraton” on it. He described the elements in my reviews that made them effective. So I think that my viewpoint was quite academic. Many people say clinical, but I personally prefer academic. Whatever it was, it was, and it seems to have resonated. I think besides, as they say, the history of our times, my work traversed a great deal in the history of food in this country, having started writing about food in about 1955. I was the food editor of Seventeen before that, but that was not serious food. There I wrote about things that teenage kids could make for parties. I was also the home furnishings editor. But given the time in relation to the end of World War II, it took about 10 years for food to become promotional again: new ideas about food emerged, many servicemen coming back from foreign countries had developed a taste for foreign food, and television became much more widespread. In 1954, I remember not having a television set and going to a friend’s house to watch television. About eight of us went because none of us had TVs, and we went to hear Edward R. Murrow demolish Senator Joseph McCarthy. We knew it was going to be a historic program. We all brought something to eat and had dinner at her house. Dione Lucas had started cooking on television in 1948, but she was one of the earliest. The whole field of mass communications had not yet begun. As that swelled, the field became much more diverse, and right now it’s at such a frenetic pace. I’m very glad I’m not involved, having to rush to come up with new ideas. You have to run all over the place and eat standing up in noisy places, and eat from trucks, and a lot of things I’m not crazy about doing. The thing that really changed the style of food coverage in the press, restaurant reviews, and all the rest, was Craig Claiborne. There is no question that he broke the ice at the New York Times in 1957. Until that time, food in newspapers was primarily the work of home economists who had test kitchens, and they did those kinds of recipes. He came in with a really professional restaurant point of view, and that changed food writing very, very much. I think my chance to break through came at New York Magazine. I’d been writing about food a little bit before then, but at New York Magazine you could be very “in your face.” You could hate things. [Editor] Clay Felker liked that. That brought a lot of attention to me, ultimately resulting in the New York Times calling me and asking me to go over there, which I did. Before that I had been very fortunate in having invented a number of projects that took me all over the world, so I had very good experience in a lot of foods that were pretty obscure then. Most especially the food of Southeast Asia. By the time I went to the Times, which was in 1975, I had been all over Cambodia, Thailand, Indonesia, and a lot of places which had no representation here, on the East Coast at least, so the foods were very surprising. And I absorbed all of that knowledge. In seeing how that restaurant was put together, I really learned how to be a serious restaurant critic, because when you see that everything is a choice . . .
Plus, before, or really between jobs as a critic, I was a researcher for Restaurant Associates, and the famous Joe Baum, when they were creating The Four Seasons. I did a lot of menu research on seasonal dishes and special celebration dishes, food lore, and so on. And in seeing how that restaurant was put together, I really learned how to be a serious restaurant critic, because when you see that everything is a choice—what kind of pepper are we going to put on the table, what are the steak knives going to look like, all of that—you begin to think, if you’re a critic, maybe you should pay attention to the height of the chair and the lighting, and does the steak knife really work. So my work became known as clinical or academic. I wrote what I wanted to know, what I would want to read, if I were deciding whether or not to go to a restaurant. AA: It sounds like a lot of your work was historical, even when the goal was not necessarily to write history. MS: It was indeed. A lot of it was cultural, especially about symbolic foods and dishes, and the way things used to be served. In 1000 Foods to Eat Before You Die, you see a lot of old references to what foods meant: there is [Mexican painter] Covarrubias in Bali [whose book, Island of Bali, includes detailed descriptions of Balinese foodways]; there’s the whole Dutch hutspot—the Spanish conquered the Dutch and then left, and they left behind a dirty pot, and the Dutch tasted it and have been eating it ever since. I think they washed the pot. But food is history, and, of course, the influence of one culture over another as a result of wars or colonization influences what people eat. Border food in particular countries usually reflects what’s on both sides of the border. In France, in Alsace, you have some very Germanic touches on the French cuisine, whereas if you go down to the south of France near Spain you begin to see something else. People are influenced back and forth, and I think that a country that is an outstanding example of this is China, because it is so old and so huge that it has had all kinds of influences through the ages. In Japan, for example, tempura was something developed from 16th-century Portuguese missionaries in Japan who could not eat meat on what were called fast days, or ash days, and the word in Latin was quattuor tempora, meaning four times, referring to the four weeks in the Catholic calendar during which no meat was eaten. So the Portuguese ate vegetable and seafood fritters, and the Japanese saw them, and did a little bit to them, and called it tempura. There is also a steamed sponge cake very popular in Japan that came from the Portuguese missionaries, who made a steamed pound cake. There is quite a lot of that kind of—you know—the beneficent side of some of the awful aspects of history. Who invented the veal cutlet Milanese, otherwise known as Wiener schnitzel? It’s been an argument—not the most serious argument—between Austria and Italy all of these years. So, you begin to see the more beneficent side of these awful aspects, like war. You get something good to eat, at least, many generations later. AA: From my perspective, working in Jewish studies, you watch merchants going all over the world, and you can see the food moving with them. MS: That’s right. Carp, for example was a fish that Jews brought to Europe. And of course, the bagel is a mystery—Barbara Kirshenblatt-Gimblett has written about that. I would say the only interesting thing about the origin of the bagel, which might have been copied, is the boiling before the baking, because there is nothing unusual about bread in a ring shape. Almost every culture that bakes bread has a ring of some sort. The boiling is the really different part. And yet in Germany, traditionally, there are what we call soft pretzels, like the ones that you buy on the street here. Those are boiled in the traditional German way. I don’t know if the people who sell them on the corners have boiled them, but they are crusty on the outside and soft on the inside, and they’re yeasty; in fact they call them bagel pretzels. But who did it first? … It’s like pasta. I don’t really believe that Marco Polo brought pasta back to Italy. I think any culture that had eggs and flour and water sooner or later made a noodle. And bialys, you know I’ve written a whole book on bialys. . . . I don’t really believe that Marco Polo brought pasta back to Italy. I think any culture that had eggs and flour and water sooner or later made a noodle. AA: I do. That book is more academic than some of your other work. You approach the bialy from an almost anthropological perspective. What made you decide to write a whole book on the subject? MS: I loved bialys. I knew they came from Bialystok, because many years ago in New York, Kossar’s used to have a bakery on 14th Street near Second or Third, in addition to where they are now, and both locations were both known as Kossar’s Bialystoker Kuchen Bakery—it was in the name. I was going to Eastern Europe to do a big story for Condé Nast Traveler, and Poland was one of the places I was going, and I was curious. So I said to my husband, who was going with me, let’s take a side trip to Bialystok on our own to see what I can find out. I started by doing research here. Different people owned Kossar’s then, and they had some background. Also, on the East Side, there was the Bialystoker Center and Home for the Aged. It just closed two or three years ago, very sadly. It was a nursing home, but it was also a cultural center and they published, theoretically quarterly, but maybe not every quarter, a publication called the Bialystoker Shtimme, the Voice of Bialystok. From the front cover to the middle it was in English and from the back cover to the middle it was in Yiddish. Through Kossar’s bakery I was introduced to the head of that, a lovely man who had been from Bialystok, who was well into his 90s. He told me everything he knew and gave me the names of some people in Bialystok to contact. I took some bialys with me because no one thought any existed in Poland, and I wanted to be able to show what I was talking about. At Kossar’s they warned me not to pack them in plastic, or they would get moldy. If you pack them in paper they’ll dry out; you won’t be able to eat them, but at least they won’t be moldy. We went to Bialystok and spent a whole day there with a local historian, Tomy Wisniewski. He took us all around. There were only five Jews left in the town and nobody really remembered the bialy. They only had the faintest idea. It was only made by Jewish bakers. One baker’s mother told him about this little onion roll that the Jews used to bake that everybody loved, and she remembered that there was something going on in the center, she didn’t know what, so he put a piece of cheese in the center. It didn’t taste anything like a bialy. When I got back to New York, I told the man at the center that I wanted to publish an article in the Shtimme about my search, because it was a publication that went to what they called the Bialystok landsleit [countrymen], in the diaspora all over the world. So he says, “That’ll cost you one hundred dollars.” I said okay, but that I wanted it to appear in Yiddish too, and he said, “That’ll cost you another hundred.” What I was saying was that I didn’t expect to be paid for the article. I also contacted the Forward and I did a story for them on it. So without my going out to write history, history comes into so many of the explanations (of various foods). I don’t really consider myself a historian because I don’t focus on history, but I certainly draw on it quite a bit. As a result of the Shtimme and the Forward, I began to get letters from all over the world—Australia, Israel, France, all over the United States, and Argentina. I tracked down everyone. The only ones I contacted by phone, and every other way, without actually meeting them, were in Australia. But I went to Argentina, to Israel, and France, and throughout the United States. The book is made up of all of these people’s memories and what happened to them from the bialy on. The bialy was like Proust’s madeleine. In some cases they had found local makers. In fact, the person I interviewed in Argentina was a retired bialy baker. There was a man in Israel that I interviewed; he’d become very rich. There was a Yemenite baker in his neighborhood who made a kind of roll out of pita dough that reminded him of a bialy, so he taught him how to make bialys. Bialystok is the town where Esperanto, the international language, was invented by a Jewish ophthalmologist. There were about 400 Esperanto speakers in Israel and they would meet a couple of times a year, and this man would always bring bialys from the Yemenite baker. So, if you’re talking about history, you have Esperanto; you have the whole life of Bialystok, which was very rich and colorful. I found a film on Bialystok at the National Center for Jewish Film in Massachusetts. There was a series of five films made in 1939 in Poland: A Day in Warsaw, Jewish Life in Cracow, Jewish Life in Lwow, Jewish Life in Vilna, and Jewish Life in Bialystok. I bought that film, and it was all about life in Bialystok, Esperanto, and the bialy. I did a lot of talks all around the country that year and at the Oxford Food Symposium, and I showed the film. It was a rather chilling aspect of history, but here the bread evoked the whole history. Another historical book I wrote early on was called Visions of Sugarplums, about the traditional cakes, candies, cookies, and confections in all of the countries that celebrate Christmas. Only traditional items, not invented red and green iced caked, but symbolic confections. The book is about the history of each item, what it meant, why we eat something called the Balthazar, and why we have baked goods in Germany in the shapes of animals. There was a time when instead of animal sacrifices, which the poor could not afford, they baked either a bread or a cookie in the shape of an animal. In fact, bread baked in the shape of an animal goes back to Egypt. The ancient Egyptians did it to amuse children. So, I mean that without my going out to write history, history comes into so many of the explanations. I don’t really consider myself a historian, because I don’t focus on history, but I certainly draw on it quite a bit. I was also the historic foods consultant on the Horizon Cookbook and Illustrated History of Eating and Drinking Through the Ages. American Heritage did an American history, and the same publisher did a book on eating and drinking all over the world. Meryle Evans was one of the editors, and she hired me to be a food historian, tracing the histories of the dishes and doing some of the recipes. I remember researching vitello tonnato, which translates as “tuna-ed” veal. Veal was much cheaper than tuna, but tuna was the taste that everyone wanted, so they would boil veal with anchovies or very salty fish, so that the flavor of the fish would get into the meat. Then they would make a sauce of the reduced stock. So it was tuna-ed veal, but it never saw tuna. I also included the history of the Wiener schnitzel. I had a lot of history in The German Cookbook. 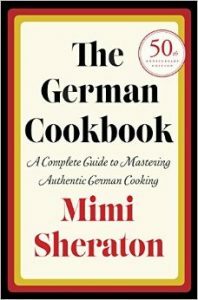 My German cookbook has been in print since October 1965, and last November Random House issued the 50th anniversary edition. I added a preface including recommended restaurants and food stores in Austria, Germany, and throughout the United States. It’s been selling very well, and it includes a lot of the history of dishes—things like what Ludwig the Mad liked to eat, or which dishes were related to Danish food in the Schleswig-Holstein region, which at one time was part of Denmark, so they have a lot of similar dishes there, which are quite different from dishes in other parts of Germany. AA: The story of the bialy baked by a Yemenite baker in Israel highlights some of the problems with the idea of authenticity, doesn’t it? MS: In the early days of the New York food store Agata & Valentina, up on First Avenue and 79th, they had a Tibetan cook making marvelous mozzarella. That’s very much a New York story too. Everybody got mixed up on the Lower East Side. My husband was Italian, and I used to think of making blintzes marinara, making them like cannelloni. It’s not such a big stretch. Or matzah brei with mozzarella in it—what could be bad? AA: I’m interested in the way we understand authenticity. People seem very invested in, for example, having a Italian grandmother cook their cannelloni. Does it really matter who is doing the cooking? Or is the important thing the recipe itself? MS: I don’t think it matters who is doing the cooking. I think what matters is the dish. We have a couple of very good Italian chefs who are not Italian. Michael White is not Italian; Mark Strausman is not Italian. They’re very, very good Italian chefs, both of them. So, I think it’s what they do. I once interviewed the Italian journalist Luigi Barzini, who was very big on food. He had a big estate in Tuscany and his cook was Filipino. He said that the best Italian cooks in the homes of wealthy Italians were Filipino cooks. I once went to dinner at the Missonis’—they served marvelous food made by a Filipino chef, but Rosita and Tai Missoni had trained him in the way Italian food should be done. It also depends also on the personality of the cook. I mean, if the cook isn’t going to be able resist dumping some cumin into the spaghetti sauce because it doesn’t quite taste right to him, then you’re in trouble, but if someone gets it, then it doesn’t matter who is doing the cooking. AA: So it is a matter of being steeped in the culture and perhaps the history of a cuisine? MS: And I think having a palate that understands the differences in cuisines. AA: Your newest book, 1000 Foods to Eat Before You Die, deals with so many different cuisines. You must have been researching it for years. MS: Ten years of putting it down and picking it up again. AA: How did you choose the thousand? I don’t think it matters who is doing the cooking. I think what matters is the dish. We have a couple of very good Italian chefs who are not Italian. Michael White is not Italian; Mark Strausman is not Italian. They’re very, very good Italian chefs, both of them. So, I think it’s what they do. MS: I sat down with a pen and a pad and I started writing. After a few days I had 1,800 items on my list, many of which were dropped in favor of other things that presented themselves later. I thought in categories: what do I want from France, and what do I want from Italy—that I know about. As I did the research, I found a few things that I didn’t know about that I thought should be included. I also included what we called in the index “cultural feasts”—inspirations for foods and meals from books, films, and paintings, a lot of which is historic. After I had the list, the hard part was writing, and the really hard part was finding sources for everything. You’ll notice that each piece is annotated one way or another, whether it’s a restaurant or a food store, a mail order source or a recipe. A reliable recipe in a book and online—that’s what the publisher wanted wherever possible. I had a researcher doing that part, and I checked every source that she found and decided which I wanted. So it was a lot of nitty gritty, which I hate. AA: Was it hard to be objective? Do you have favorites among the thousand? MS: Well, the book isn’t meant to be about what is best. It represents what the people in the world eat. There were important dishes that, whether historically or culturally or for some reason, struck me as something you should eat before you die. Some of them are pretty hard to take, like vegemite, which is . . . yuck. But it’s like peanut butter in Australia and New Zealand. Kids spread it on bread and love it. So, it’s a little bit about tolerance and opening your mind. I was very impressed with the food of West Africa when I began researching it here in New York, in Harlem, especially the foods of Senegal and Nigeria, which I think are going to begin to influence our cuisine very much. It just has the right look and right kind of tastes and textures. Now that there are restaurants fancy enough to be mainstream and non-West Africans can try the food—and chefs are always looking for new seasonings and new spices—I think it will influence our food in the next two to four years. So that was something else I wanted to include. AA: Since you’ve mentioned new influences on our cuisine, what do you think about the current Middle Eastern food trend? I was very impressed with the food of West Africa when I began researching it here in New York, in Harlem, especially the foods of Senegal and Nigeria, which I think are going to begin to influence our cuisine very much. MS: I love it. I think right now it is a very hot influence. Middle Eastern, also in terms of North African and Israeli. There is a very good restaurant near here called Mémé, which is run by two Israeli brothers of Moroccan descent. They serve all sorts of mezze, and they do a fabulous shakshuka at lunch and brunch, and a tagine. I think it’s a very big influence—the hummus rage is everywhere. Oleana, in Cambridge [Massachusetts], reflects that quite a bit. To some extent, I think of the trend as more eastern Mediterranean than I do Middle Eastern. The foods of the eastern Mediterranean are almost exactly the same as the foods of the western Mediterranean—eggplants and tomatoes and olives. What’s new is the use of more spices than fresh herbs as seasoning; that’s just my impression. They are heavier, more complex preparations of … [dishes that are] basically very similar to things like ratatouille. . . .
AA: So they are new flavors, but are familiar enough for people here to be comfortable with them? MS: Right. They’re different, and there is more of a flavor bang. I think that as our palates become more desensitized by overstimulation, we keep looking for new flavors. In England, the chef that has made a huge difference, certainly there and here, is Yotam Ottolenghi, who is Israeli and who does this kind of mixed cooking, with cumin and za’atar, and his books have sold very well here. He has had a big influence. AA: Israeli food is really interesting because of its mix of ethnicities. MS: Absolutely, and for a long time it wasn’t presented that way. When I was there in 1994, the food had a very bad reputation, most of which was well deserved, but in international restaurants. In the Bukharin, Yemenite, Tunisian, and Moroccan restaurants, the food was terrific. It was when I went to an Italian, French, or Chinese place that the food was pretty horrible. AA: My father’s family is from originally Yemen and moved to Palestine in 1938. I remember visiting Israel often and always thought the food was great, maybe because we always went straight from the airport to a Middle Eastern restaurant. MS: To me the Yemenite food was a big surprise. I thought some of the more interesting foods were Yemenite, Tunisian, and Moroccan. I was surprised that the Ashkenazi places were not good, because so much of Israel was built by Ashkenazi Jews, but it’s pretty hard to find that cooking done well even in New York, at least in a restaurant. You can find good Ashkenazi cooking in homes. AA: Ashkenazi food is making a little bit of a comeback in Israel. There is a trend toward “Jewish” foods, meaning Ashkenazi. MS: For a long time Sephardic food, which is basically Middle Eastern, was overtaking Ashkenazi food here in the U.S. for a number of reasons. It was more healthful. Ashkenazi food was like wall-to-wall-cholesterol, and people began to hear that it’s not good for you. Sephardic is Mediterranean—olive oil and eggplant. Also younger people, even if they were kosher, did not like the look of the Ashkenazi delis and dairy restaurants. They were very sloppy and the younger generation really didn’t like that. So we still have dairy restaurants, but now they’re hummus and pita and that kind of thing. AA: Was growing up in Brooklyn a big influence on you? MS: Absolutely. Certainly my mother’s cooking was, but we also ate out a lot. We were not kosher. We used to go to Sheepshead Bay a lot to eat at Lundy’s, and my mother cooked lobster, clams, ham, and everything at home. The other kind of restaurants we went to were Chinese, of course, and steak and seafood. We didn’t go to Italian. Occasionally, my parents went to a particular French restaurant that I remember being taken to as a kid. But otherwise it was steak, seafood, Jewish delis, not so much dairy restaurants, and Chinese—big in Jewish communities—Cantonese. AA: Academics are still trying to figure out the connection between Jews and Chinese food. MS: I’ve written about that. I did a big piece at the Times once. We had a contact at the Jewish Theological Seminary, Wolfe Kelman, who was always happy to talk to the press. He told me that every Friday at the Seminary was Chinese food day. It’s hard to figure out why. Saying that Jews lived across from Chinatown doesn’t work because I have Danish Jewish friends who love Chinese food. And they even ate it in Denmark where the Chinese food is horrible. We have Parisian Jewish friends, born and raised in France, who ate Chinese food every Sunday night. AA: One theory is that because ingredients in Chinese food are generally chopped, non-kosher items are less identifiable or intimidating. Do you find that convincing? MS: Well, I think I know why Jews liked Chinese food when they got here. What they liked was Cantonese. There was no other kind of Chinese food then. My parents went to Chinatown a lot, and there were Chinese restaurants in our neighborhood, but it was all Cantonese. It was made with onions and celery, sautéed soft, crisp noodles, a lot of chicken, chicken soup with wontons that were like kreplach, and the beverage was tea, and it was cheap, and you shared. You could take a big family out to dinner, and everybody shared. Really kosher people wouldn’t go. Semi-kosher people would go and not order shrimp or pork. While I was reviewing for the Times we began to get a crop of kosher Chinese restaurants. They were generally horrible. They would use corned beef for ham, and made all kinds of weird substitutions. But in general, I think Chinese food was cheap, it was soft and mild flavored and oniony. We only ordered about 10 dishes from the menu: subgum, chow mein, chop suey, sometimes egg foo young; my mother liked beef and peppers. The same dishes kept coming up, and every time I went to a Chinese restaurant I wanted to order something new. I thought, “There are other things on the menu. Why do we keep [ordering the same thing?] . . .” Now Jewish people go to all the different kinds of Chinese restaurants, but it was Cantonese that really got them in the beginning. We weren’t kosher. My mother cooked ham and bacon at home and once in a while she made a pork chop, but she hated the word “pork.” If you said ham is smoked pork, she’d say, “Who asked you?” But if we went to a Chinese restaurant we always ordered the roast pork appetizer. It was different there; all bets were off. Anyway, that’s a particular kind of history. I remember seeing a documentary film seven or eight years ago about Jews who were rescued from the Germans and settled in China, in Shanghai in particular. After the film, the director took questions, and I asked, “Were the Jews in Shanghai happy to be eating Chinese food?” But that’s not where the connection began. I had been eating Chinese food long before that. That’s certainly history. One of the most sumptuous of Italy’s cold summertime dishes, and a creation worthy of the most demanding cognoscenti, vitello tonnato can be served as an appetizer or as a light luncheon or late-supper main course. Unsurprisingly, the preparation of those paper-thin slices of rose-pink veal and that tangy, silky sauce is subject to the differences of opinion that surround so many revered dishes. Many agree that the veal rump or loin should be poached with bay leaves, vegetables, and garlic prior to being chilled and very thinly sliced. The veal is then napped with a sauce based on tuna, a little anchovy, and capers—and here is where roads most commonly diverge. Traditionalists insist that the sauce should contain no mayonnaise; instead, the tuna must be worked with olive oil and trickles of the poaching stock until it becomes a mayonnaise-like emulsion. Of course, whipping the tuna into mayonnaise with some olive oil added as a thinner is an easier way to achieve that silky consistency, so this method has become increasingly common among cooks. In either case, the tuna must be of the oil-packed, jarred variety, so as to be intensely salty and mashingly soft. Fresh tuna simply doesn’t cut it. Another variation, this one a smart innovation recommended by the English food writer Elizabeth David, is to roast the veal to a medium-rare state, rather than poaching it, so the meat remains firm and does not become waterlogged. A look at the dish’s origins, by way of the Livornese cookbook Il Cuciniere Italiano Moderno (1842), sheds some light on the reasoning behind its unusual flavor dichotomy. At the time, veal was much less expensive than tuna, and was often seasoned to taste like a substitute, such as mock tuna. Tuna itself never touched the dish. Rather, cuts of veal were boiled with anchovies to impart a fishy flavor to the meat, and the simmered-down stock—anchovies and all—was beaten with olive oil into a thickened sauce. Fishy veal was the result. Surely modern versions are more sublime, especially when served with some good hearty bread and a glass of dry white wine. Where: In New York, Da Silvano, tel 212-982-2343, dasilvano.com. Further information and recipe: Italian Food by Elizabeth David (1999). 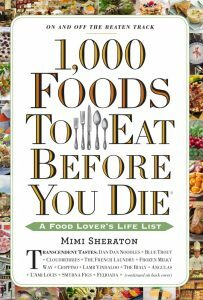 Excerpted from 1,000 Foods to Eat Before You Die: A Food Lover’s Life List by Mimi Sheraton (Workman Publishing). Reprinted with permission. Ari Ariel is the editor-in-chief of NYFoodstory: The Journal of the Culinary Historians of New York. He is adjunct assistant professor of history at the University of Iowa. Previously he served as assistant professor and faculty coordinator of the gastronomy program at Boston University, Metropolitan College. He holds a Ph.D. from Columbia University and a diploma in classical culinary arts from the French Culinary Institute (now the International Culinary Center). His book, Jewish-Muslim Relations and Migration from Yemen to Palestine in the Late Nineteenth and Twentieth Centuries, was published by Brill in 2014.